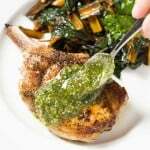 Pan seared, bone in pork chops with an orange parsley sauce. Full of flavor, easy to cook, and healthy as can be! 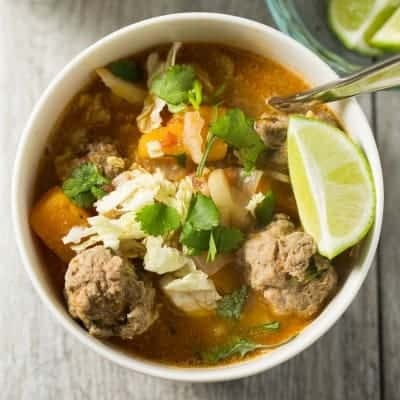 Paleo, gluten free, low carb, dairy free and Whole30. Shawn and I went on our first date since having Josh! We went to the movies AND went out to dinner. My wonderful parents babysat Josh, and I didn’t have to worry for a second because they take such amazing care of him. 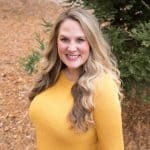 It’s a whole new ball game getting ready for a date after having a baby. Not only do I get myself all dolled up, which is a nice change from my usual yoga pants and pony tail look. But I have to get everything ready for the baby. Change of clothes, pumped bottles and diapers, oh my! I surprised even myself that I had everything ready and we got to the movie on time. We went out to dinner after, and of course talked about Josh the whole time. We even looked at pictures of him, and watched videos of him. All this work to get some alone time, and all we want to do is gush over our lovable boy! We decided that we are going to go on one date a month where we actually get out of the house just the 2 of us. But every Saturday feels like date night, even when we’re at home. We wait to eat dinner until really late after Josh goes to bed. I cook us up something semi fancy, and we eat dinner together with a glass of wine. 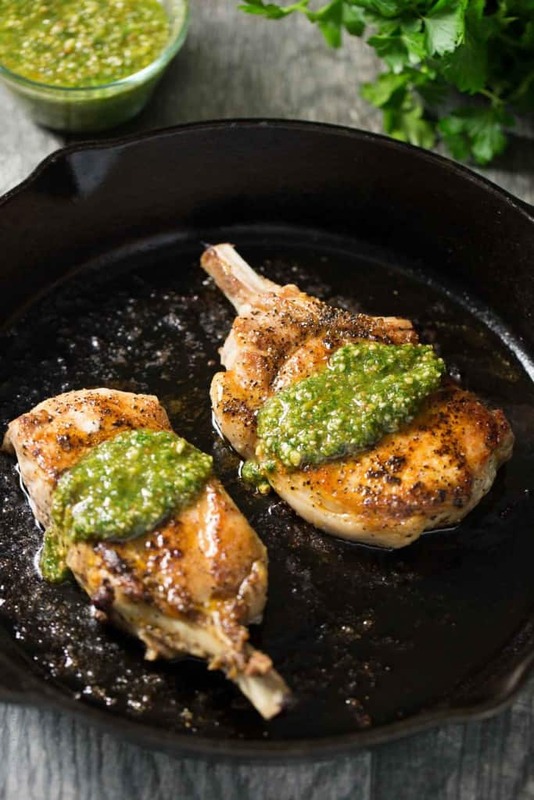 One of my favorites I’ve cooked lately are these pork chops with orange parsley sauce. A super easy dinner to make, but tastes like we’re eating out at a restaurant. You start with some gorgeous bone in pork chops. The bones give it way more flavor and keep it juicy. I use my cast iron skillet to give it a golden, gorgeous crust. Then finish cooking it in the oven. While it’s roasting in the oven, I make this AMAZING orange parsley sauce. And yes, AMAZING in all caps. I’m obsessed with it. In these pictures, I show the pork chops with a moderate spoonful on top of them. When I’m actually eating this, I can’t even see the pork chops under all the orange parsley sauce I spoon on top. It is delicious! 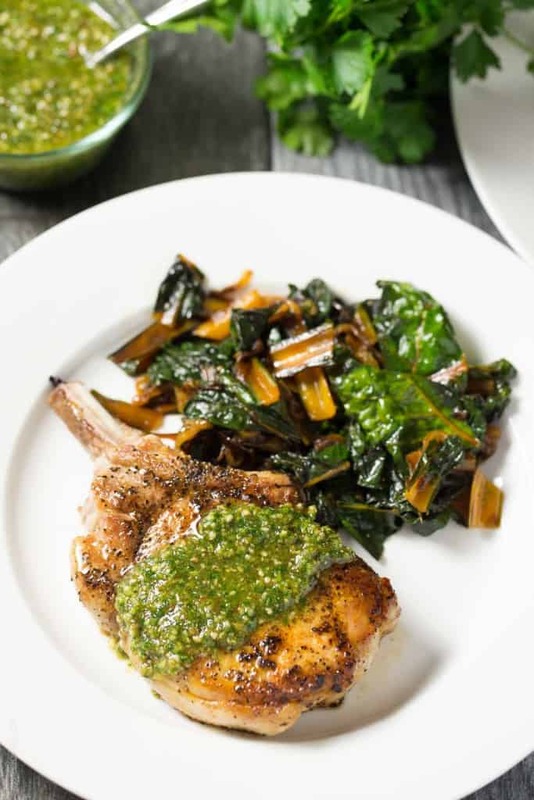 I love serving these pork chops with my orange braised rainbow chard and my perfect roasted potatoes. The orange parsley sauce is so good on top of the roasted potatoes too. Perfect date night dinner to enjoy at home. And it’s healthy! All real food. All real ingredients. It’s gluten free, paleo, Whole30, dairy free and low carb. I eat the whole plate without any guilt. 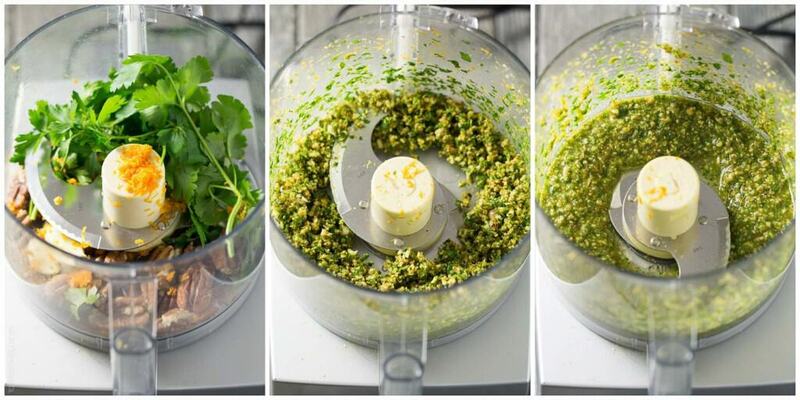 In a food processor, combine the pecans, parsley, garlic, orange zest, orange juice, olive oil and salt. Blend until combined. Add more orange juice if a thinner consistency is desired. Taste for salt and add more if necessary. Scrape the sauce into a small bowl and set aside. 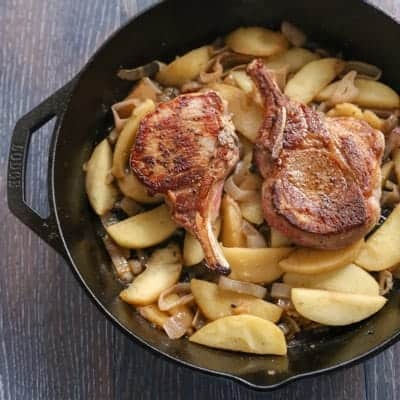 Add the olive oil to the cast iron skillet, and add the pork chops. You want to get a good crusty sear. 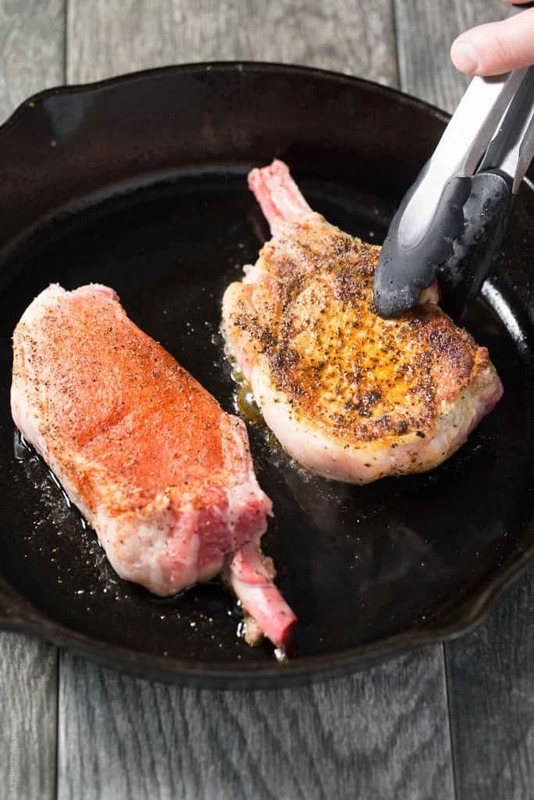 The pork chops should sizzle as soon as you add them. Cook about 3-5 minutes on the first side. Flip when golden and sear the other sides and the edges for 2-3 minutes. Transfer the cast iron skillet to the oven to finish cooking if needed. Cook the pork chops until they reach an internal temperature of 145ºF. Remove the pork chops from the oven, and transfer to a plate to rest for 5 minutes. Serve warm, topped with a generous amount of the orange pecan sauce. Sounds like you had a wonderful date night! It always feels good to get dressed up! 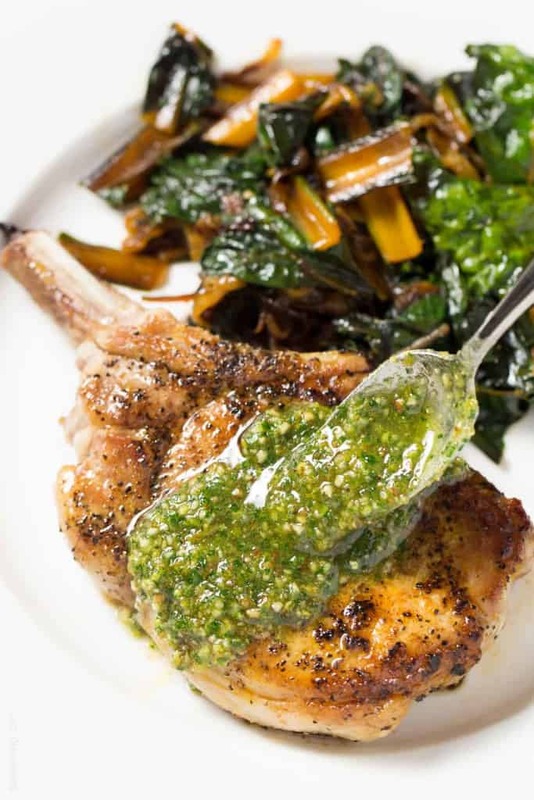 These pork chops look like the perfect stay-at-home date night dinner. I love the orange pecan pesto, Natalie! So creative and sounds so flavorful! A very fun date night! Nice being just Nat and Shawn again, even if we just talk about Josh the whole time. Haha! Thanks Gayle! I want to try this! I haven’t made pork chops in years because I always always always over cook them. But now that I have a cast iron skillet it might be time to try them again. Love the looks of your pesto, too! I don’t make pork chops too often either. But after this recipe, I’ll be making them all the time! So good! Thanks friend! Aaw yay for date night, so glad you guys got a night out alone :) These pork chops would make a delicious meal for staying in too! 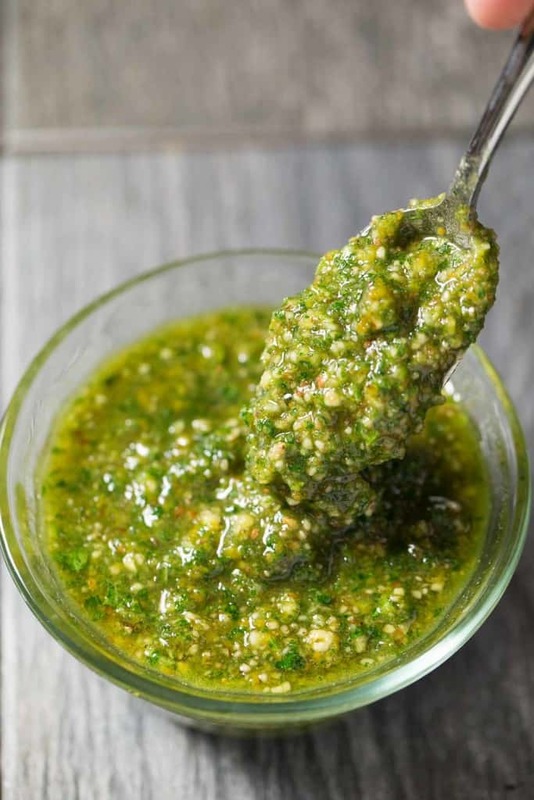 The orange pecan pesto sounds amazing! I’m so glad you were able to enjoy a night out just the two of you! Brad and I often do the late dinner at home after the kids are in bed, but we don’t get out nearly often enough! These pork chops are making me hungry! I love the idea of combining orange and pecans in pesto! Was so nice having some couple time. Even though all we wanted to talk about was Josh. Ha! I bet you know how that is. Thanks Kristine! I’ve been making pork chops more often lately and I’m hooked! I neeeeeeed to try them with this orange pecan pesto. It looks amazing! Glad you two are getting to enjoy some time out of the house! You’ll love them! Takes pork chops to the next level! Yea! So glad to hear that Tally! Glad you liked my recipe. Thanks for taking the time to let me know. You just made my day! Thank you so much for this recipe!!! It created the JUICIEST pork chops I’ve ever had the pleasure of eating. And Whole 30 friendly?? Life saver. You rock!